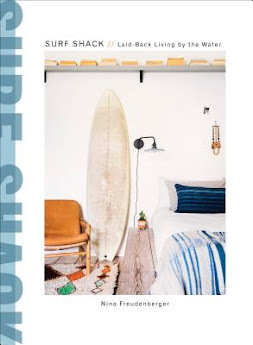 Everything Coastal....: Caron's Beach House has a Featured Product in Coastal Living Mag! 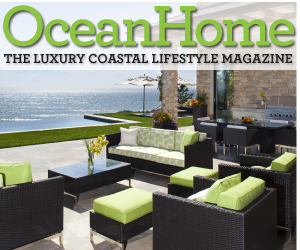 Caron's Beach House has a Featured Product in Coastal Living Mag! So excited! 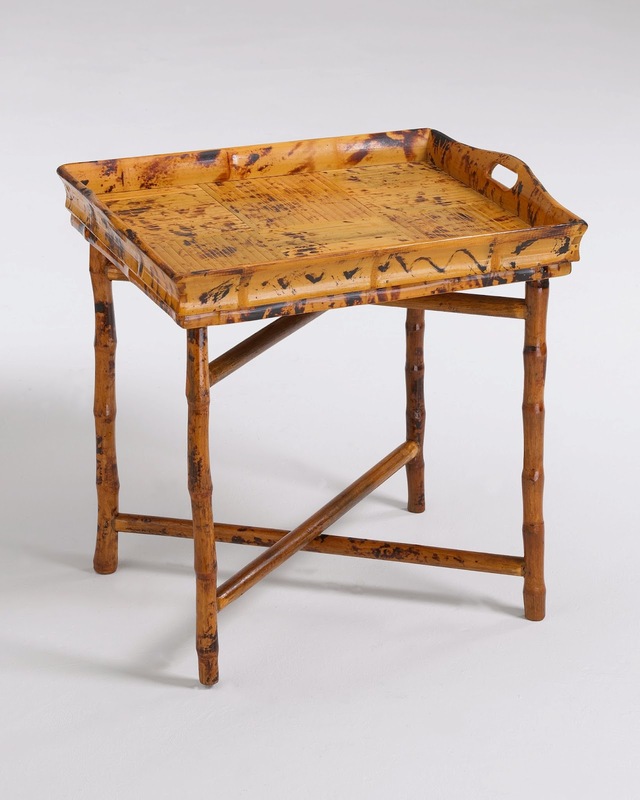 We were not sure that our little table would make the final cut for the article in April, and we were not sure exactly where our Antique Tortoise Table would appear in the the magazine. 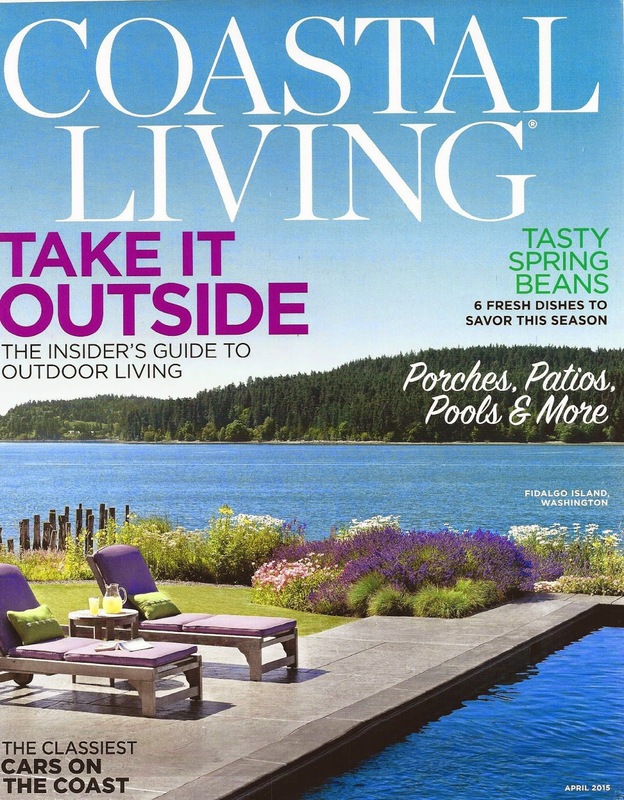 Imagine my surprise and delight, when we were in our local New Leaf grocery store and I happened to pick up a copy of the April issue of Coastal Living at the check out while standing in line. 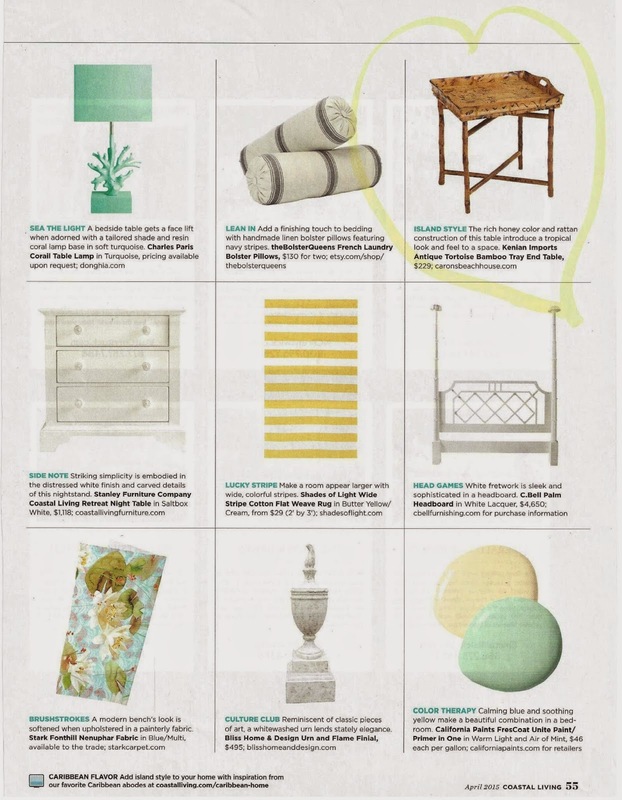 Woo Hoo - there was our cute little coastal bamboo table, part of the "Get the Look - Anguilla" article! I began to do a happy dance all around the other shoppers (much to Tom's embarrassment....) and bought 3 copies to send to our families. 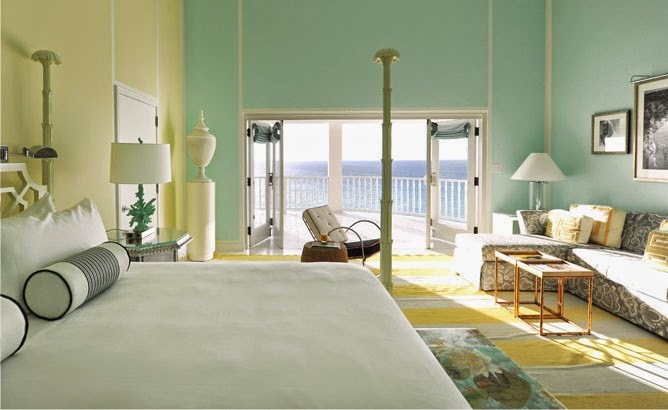 Love the butter yellow and light aqua-mint green combination of the resort rooms at Malliouhana. 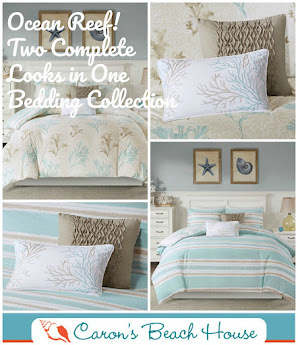 Relaxing, stress free coastal shades, as well as fresh and spring-like. 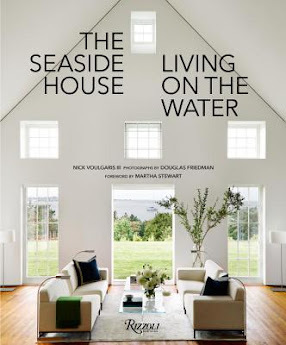 Combined with a touch of black and white in the artwork, this room comes alive, and doesn't feel "beach cottage", but actually much more elegant. 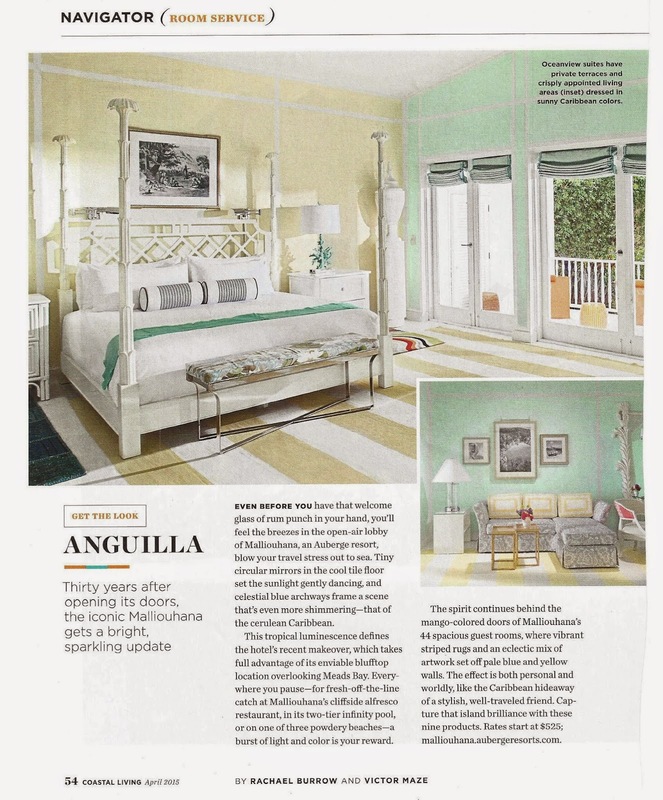 I also think that the bamboo-rattan touches give this room a more island feel with a nod to British Colonial style. 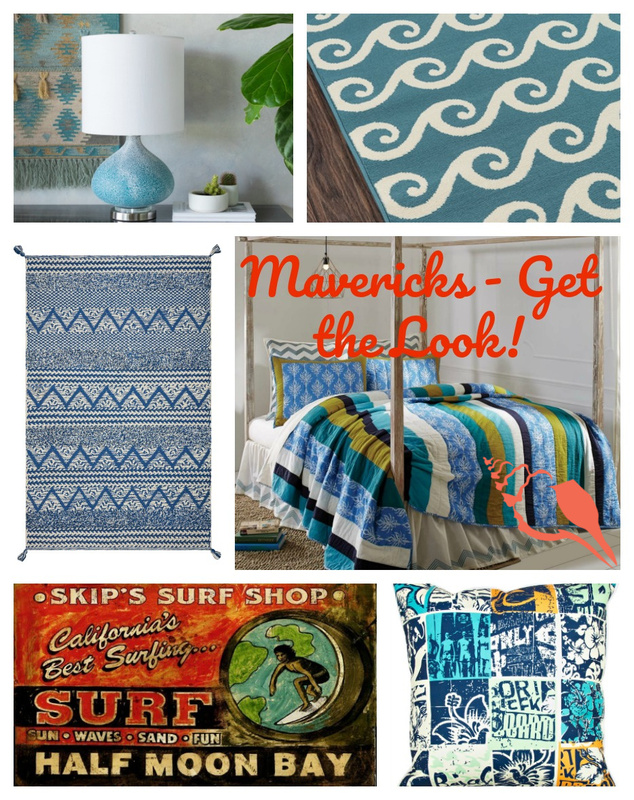 Here's a few ideas from Caron's Beach House to capture "The Look". 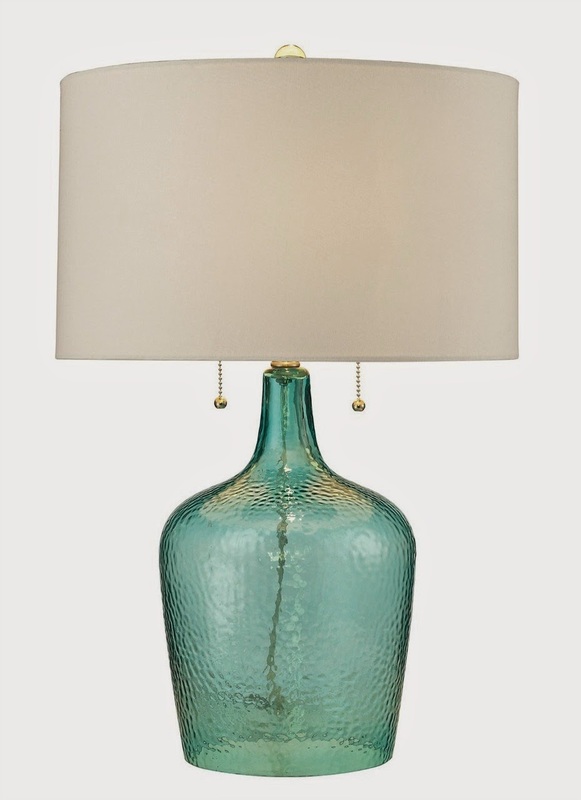 Or maybe just a pretty turquoise glass lamp? 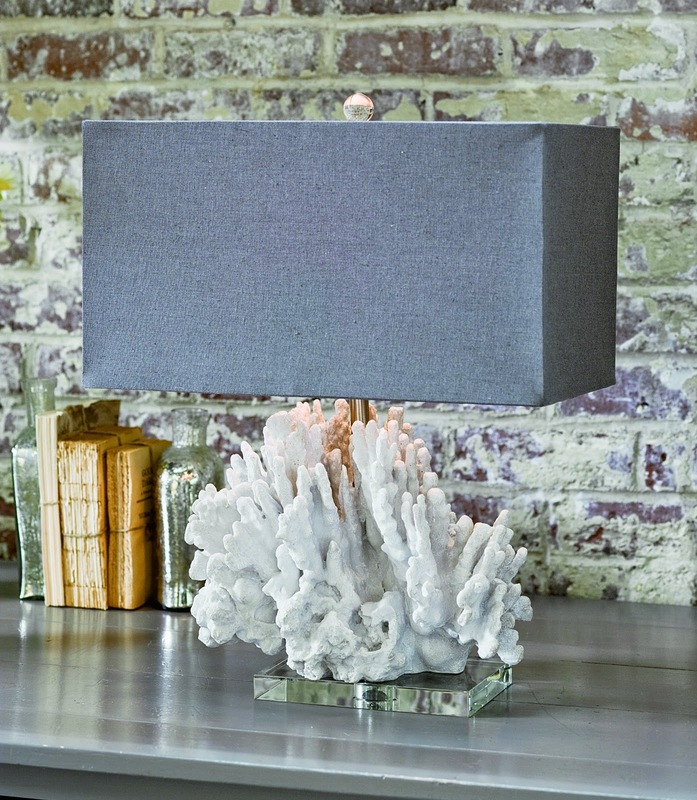 We just sent two of these Hatteras Seabreeze lamps to a new Margaritaville Hotel being built in Miami! 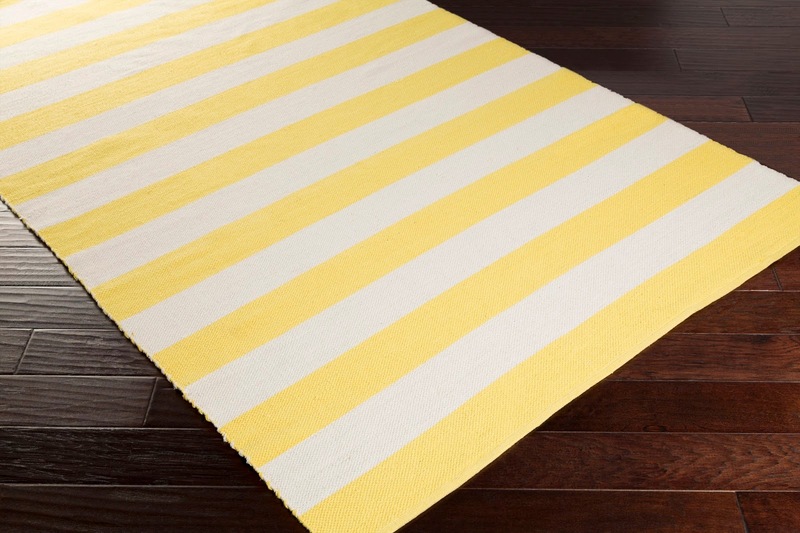 Yellow Stripes - love these new rugs that we just added for spring. 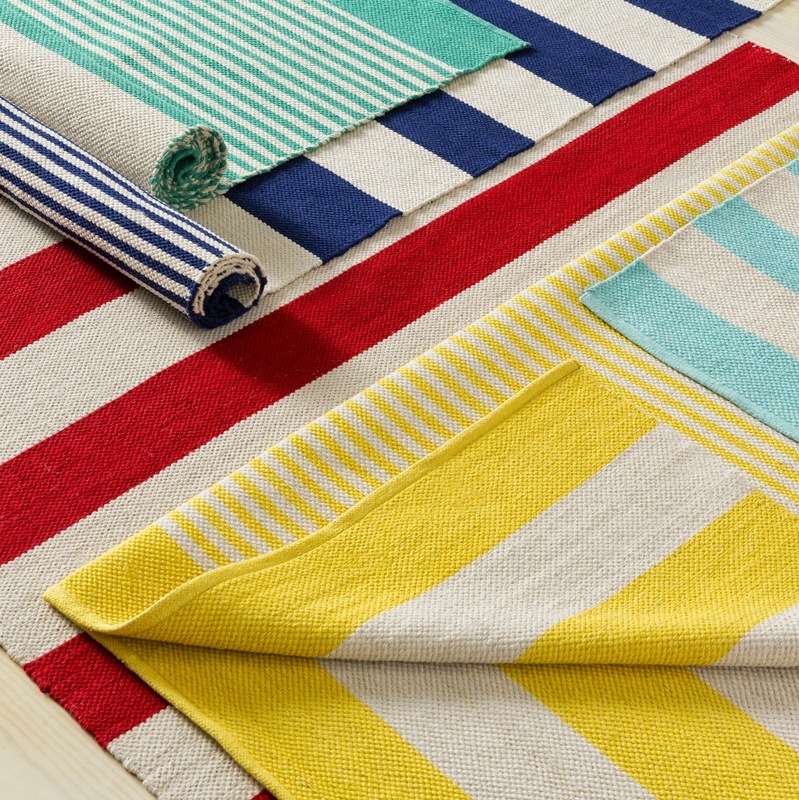 The rugs are 100% cotton and reversible, wide stripes on one side, skinny stripes on the other side. 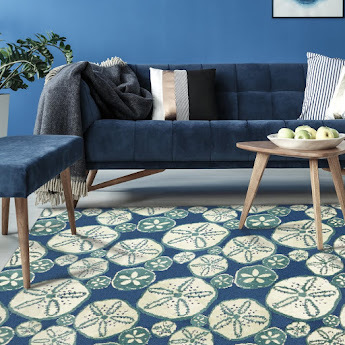 Two beach house rug looks for the price of one! 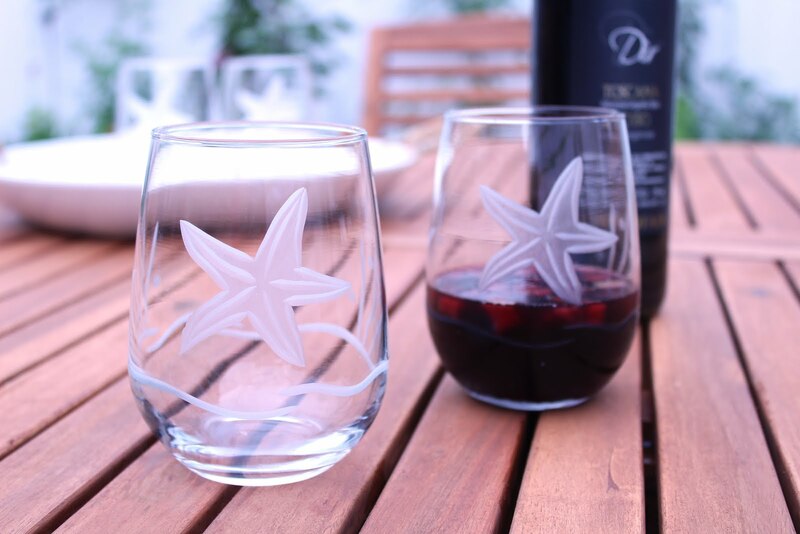 Or if you prefer, we have more colors to choose from! There's just something about Black and White art that fascinates me. 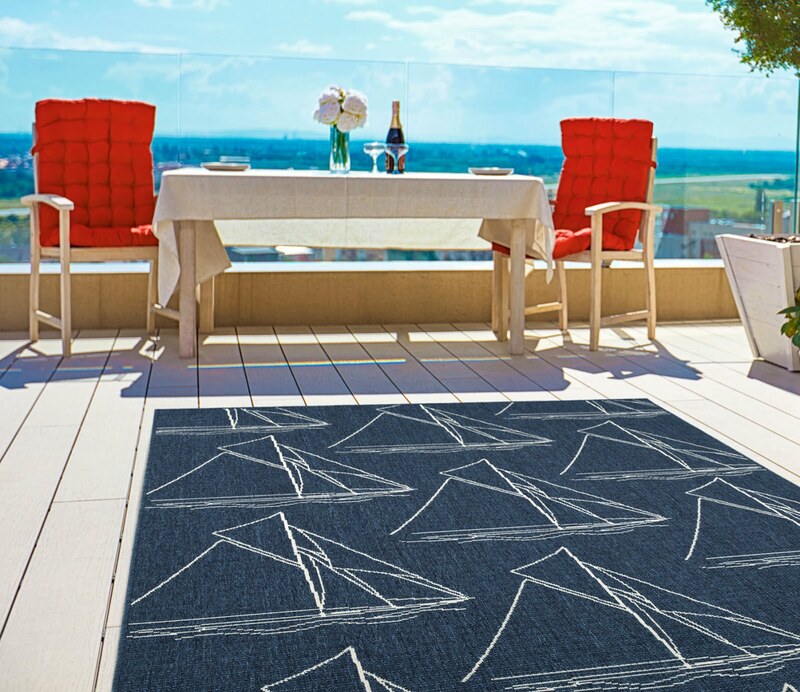 And don't forget a fun throw to curl up with, and watch the sunset from that fabulous patio! 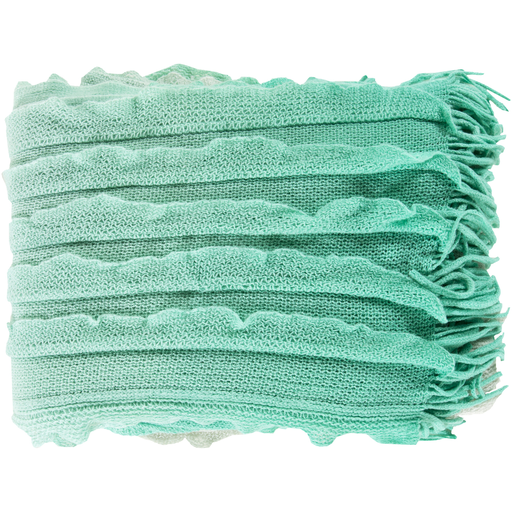 Love these aqua ruffled mint throws - just for that extra touch of interesting texture and design to complete a room. 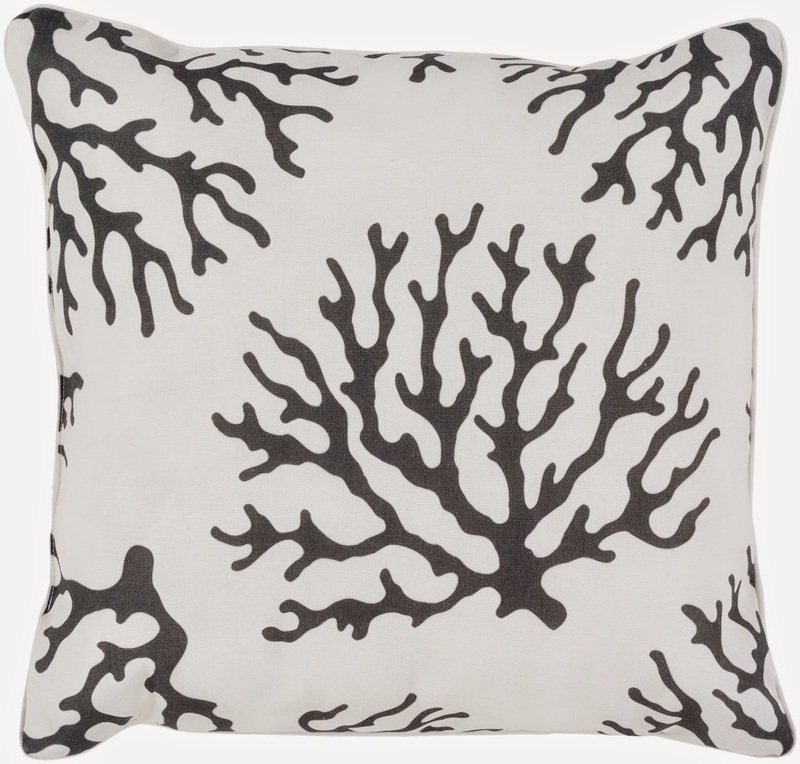 Would love to hear what you all think about this color combo!